Author Chat with Jan Eldredge (Evangeline Of The Bayou)! Today we're excited to chat with Jan Eldredge, author of Evangeline Of The Bayou. Read on for more about Jan and her book! Jan was born and raised in the swampy state of Louisiana where as a child she would often sneak into her older brother’s room to read through his numerous monster magazines and scary comic books, and where she would also gaze at his collection of classic movie monster models like the Wolfman, Frankenstein’s Monster, and the Creature from the Black Lagoon. In addition to her interest in cats, magic, and assorted eldritch things that go bump in the night, she enjoys researching bizarre superstitions, exploring old cemeteries, and visiting assorted theme parks. Halloween is her favorite holiday, but that probably goes without saying. Jan now lives in the swampy state of Florida with her wonderful husband, three pleasant children, and four devious cats, in a house that just might be haunted. 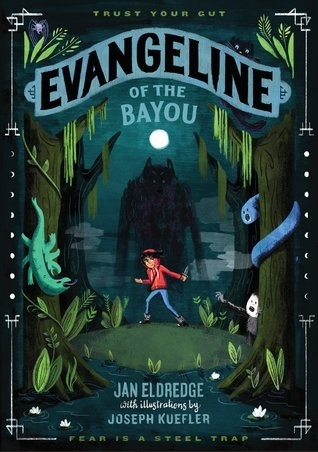 EVANGELINE OF THE BAYOU, published by HarperCollins Balzer + Bray, is her debut middle grade novel. Meet Evangeline Of The Bayou! A few years ago I was browsing around in a small bookstore, and one of the items that caught my eye was a dictionary of superstitions. I started thumbing through it and was instantly spellbound. I’d always had a fascination with spooky creatures, so the pairing of superstitions and monsters felt like a perfect fit. Having been born and raised in Louisiana, my home state provided the ideal setting for the story of a spunky monster-hunting heroine like Evangeline. Aside from the main character, Evangeline, I have to say I really adore Fader, Gran’s four-eared feline familiar. He has sass and attitude, and he gives Evangeline a hard time, but inside, he has a heart of gold. It was definitely the novel that came first. My original title for the book was SWAMP WITCH. I knew it would likely get changed, and I was okay with that. After a lot of back-and-forth brainstorming between my editor and me, it was actually the book’s illustrator, Joseph Kuefler, who suggested EVANGELINE OF THE BAYOU. Learn to embrace the revision process! I used to feel a lot of resistance when it came to deleting or rewritng large chunks of my stories. It wasn’t because I thought my words were perfect; it was because I’d worked so long and so hard to get them out of my head and onto the page. But after doing my first major manuscript revision early in the agent-querying process, a revision where I ripped out the guts, moved things around, and then stitched it back up again, I learned to let go and accept that losing work was part of the process. However, I never throw away any deleted scenes. I store them in another folder just in case I can use them somewhere else. Everything! Illustrator Joseph Kuefler did an outstanding job. I love his choice of colors. I love the subtle spookiness and the atmospheric feel of the swamp. And I love Evangeline, right down to the silver tips of her alligator-skin boots. I’m diligently at work writing the sequel to EVANGELINE OF THE BAYOU. It’s so much fun bringing back some of the characters from book one and adding fun, new, quirky characters to Evangeline’s world in book two. Many years ago when I started taking writing seriously, I thought drafting was the best part. It was fun to brainstorm and create new ideas. Now that I’ve written a few novels and short stories, I find revising to be more rewarding. My drafting process is an unorganized, sloppy mess, with words and ideas scribbled all over the place, but it’s during revision that I can see the story really starting to take shape. I wish I possessed superhuman strength or the ability to fly, but realistically I’d have to say I’m pretty good at reading people. As an introvert, I’ve always done a lot more listening and observing rather than speaking. I find human behavior fascinating.